A bilingual participatory program featuring an origin story of the diverse roots of traditional music and dance of Mexico, especially those of indigenous, Spanish and African cultures. Musical duo sings in Spanish and English and performs on a variety of Latin American instruments. Interactive, multicultural, educational and FUN musical programs for the whole family! 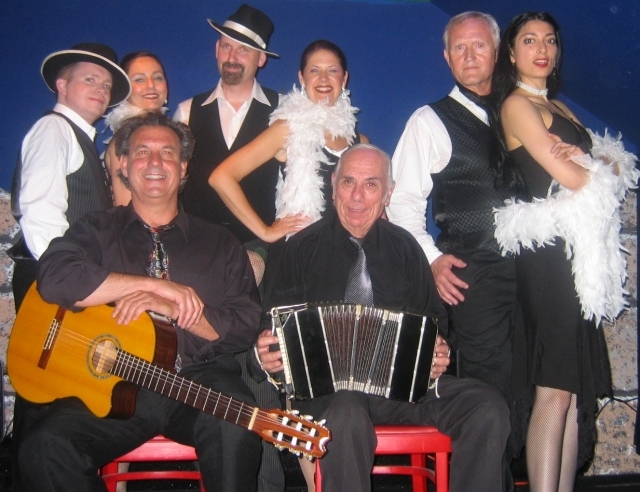 Authentic Argentine tango music duo of guitar/vocal & bandoneón (type of accordion); tango dancers could be included. $400 for 1.5 hours in the San Francisco area. Mr. Santos is a music instructor specializing in interactive children’s programs for age’s pre-k to 5th grade. Based in a Latin American Traditional Story, the program takes children directly to the heart of the Amazon Jungle, where the hunt of an Anaconda snake takes place. With suspense, harmonica melodies and plenty of laughter these stories are told with an energetic and lively Latin American style. $300 for 45 minutes. Check out the YouTube video Minisifundio. In April 2011, Chiquy Boom performed at the Elmhurt and Chavez branches of Oakland Public Library for Día de los Niños, Día de los Libros. The show was educational; incoporating colors, vowels, English, Spanish and sign language. Claudia Cuentas is a singer, writer, musician, bilingual storyteller and youth educator who has a deep love and belief in the power of transformation through the Arts. Germar (aka Gerardo Martinez) is a Vallejo, California, USA based magican who strives to entertain and educate his audience through his magic and illusions. With her poetic eloquence Olga’s stories are an impassioned quest to keep alive not only the fabric of her family but the larger Latino culture, richly robed in folktales, ancient myths, and history. There are personal tales, short stories inspired from a mix of newspaper and dream, healing stories, tales of extraordinary women, of myriad voices and inflections, and sometimes music and dance. “Would you like everyone to remember your party? Then you are in the right place! Marcela is the perfect addition for your kid’s birthday party, family party, picnic, corporate event, Halloween party, or any other special event!